Kids learn the parts of a book by being taught what we call them. Kids can trace and write the parts of a book and then they can identify them by circling them. 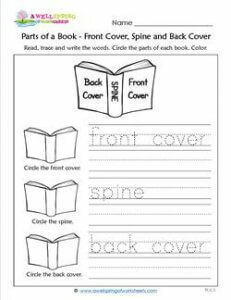 This worksheet is meant to be used after this one and in conjunction with oral instruction about the parts of a book.